The Usine Ste Madeleine pond once nourished the now-defunct sugarcane plantation but is now being used as a pool of death for murderers. Within the last four months, Southern Division police were burdened with the murders of three people. 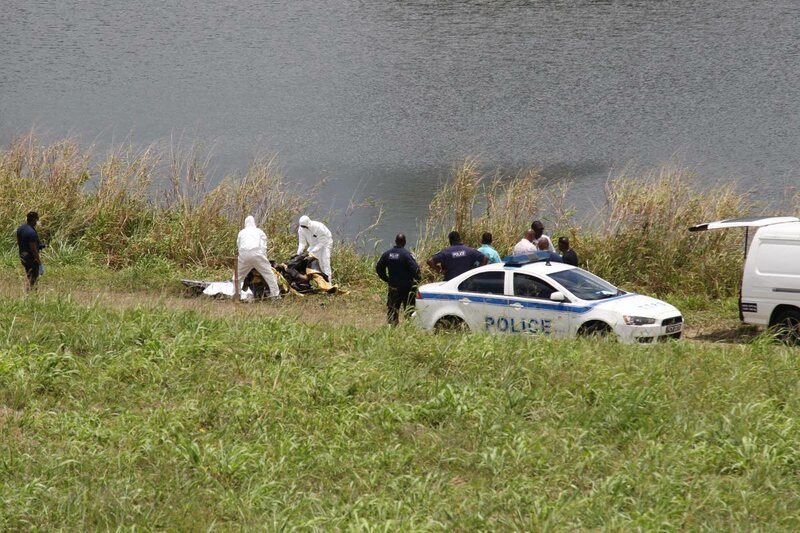 Police yesterday found the latest victim, a decomposing body of a man dumped inside the pond. The unidentified man was wrapped in plastic and linoleum and placed inside garbage bags. Both the hands and feet were bound with wire and a piece of cloth wrapped around his neck. Shortly before 11 am yesterday, ASP Ali-Mohammed, Insp Don Gajadhar, Insp Figaro and other police from the division and Homicide Bureau Region III visited the scene. The victim is of mixed descent and light brown in complexion with a tattoo on his left arm. He was wearing only a pair of three-quarter pants. After the body was fished out, a District Medical Officer viewed it and ordered its removed to the Forensic Science Centre in St James. Earlier in the morning, passers-by reported to police that there was a strange object in the pond. People regularly fish in the pond. Police are asking anyone with information to contact the nearest police station or Homicide Bureau at 652- 0495. Only on January 29, Ste Madeleine police found the body of PH driver Richard Beharry, 24, in a white Nissan AD Wagon that was partially submerged in the pond. Divers from Mon Repos Fire Station fished out the body which was slumped in the backseat with a gunshot wound to this head. Both the hands and feet were bound with duct tape. A concrete brick was placed on the accelerator pedal. Supt Rohan Pardasie, ASP Peter Ramdeen, Insps Gajadhar and Darryl Corrie, Insp Allister Jones, Sgt Anil Sankar and other police visited the scene and searched for the killers. A month earlier on December 1, passers-by found the body of Canadian citizen Vishnu Narine, 57, in a gravel road near the bank of the pond. He had a gunshot to his face. On September 31, 2015, the body of Cheryl Mohammed, 55, was fished out of the pond. Mohammed, of La Romaine, was fully dressed. The body had no visible marks of violence. An autopsy later found that the cause of her death was undetermined. Reply to "Third body fished out Usine Ste Madeleine pond"